NASA's Stardust-NExT mission took this image of comet Tempel 1 at 8:39 p.m. PST on Feb 14, 2011. The comet was first visited by NASA's Deep Impact mission in 2005. This story was updated at 12:44 p.m. EST. NASA has released the first photos of the comet Tempel 1 taken by its Stardust probe late yesterday (Feb. 14), showing the icy wanderer in the distance as the spacecraft drew nearer for a closer look. The Stardust probe flew to within 112 miles (181 kilometers) of comet Tempel 1 at 11:39 p.m. EST yesterday (0439 GMT today), and the spacecraft began beaming home the first of its 72 high-resolution images from the close encounter about four hours later. Mission scientists hoped the spacecraft would send the five photos bracketing closest approach first, but a minor glitch prevented that from happening. NASA's Stardust-NExT mission transmitted the first image it took during its approach to comet Tempel 1 at 8:35 p.m. PST (11:35 p.m. EST) on Feb. 14, 2011, from a distance of approximately 2,462 kilometers (1,530 miles). The comet was first visited by NASA's Deep Impact mission in 2005. The first pictures to be beamed back to Earth were the earliest ones taken by Stardust as it approached Tempel 1 from about 1,600 miles (2,575 km) away. 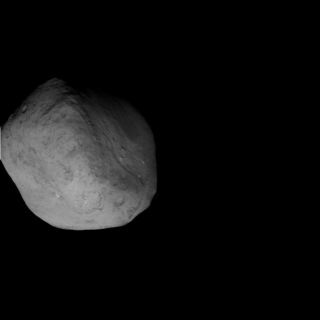 From such a distance, Tempel 1 has an angular appearance that gives it a triangular or diamond-like look in Stardust's initial flyby photos. Over the next few hours, more views of comet Tempel 1 taken as Stardust flew ever-closer to its target were released by NASA . In those later views, comet Tempel 1 appears as a rough, misshapen object with craters easily visible. Stardust's photos of comet Tempel 1 are the first new close-up views of the comet in nearly six years. In July 2005, NASA's Deep Impact spacecraft visited the comet and crashed a small probe into its icy surface to determine the composition of Tempel 1. At the time of its closest approach to Tempel 1, the Stardust spacecraft was about 209 million miles (336 million km) from Earth, NASA officials have said. NASA will hold a press conference on NASA TV at 3:30 p.m. EST (2030 GMT) to discuss the latest results from the new comet Tempel 1 flyby. The Stardust spacecraft took 122 photos of comet Tempel 1 during its Valentine's Day rendezvous last night. Of those, about 72 are expected to be high-resolution close ups of the comet, NASA officials said. The 3.7-mile-wide (6 km) Tempel 1 orbits the sun once every 5 1/2 years, so it had made one trip around the sun since Deep Impact's visit. Stardust's visit to comet Tempel 1, called the Stardust-NExT mission, is aimed at helping scientists learn how much the comet has changed during this time. Researchers also want Stardust-NExT to map more of Tempel 1's surface, and they had hoped to see the crater Deep Impact created. The huge debris plume raised by the impact obscured the feature during that mission, preventing Deep Impact from getting a good look. NASA's Stardust-NExT mission took this image of comet Tempel 1 at 8:38 p.m. PST on Feb 14, 2011. Stardust-NExT has logged just over 3.5 billion miles (5.7 billion km) during its 12 years in space. But this comet encounter will likely be the probe's last mission, since it burned up almost all of its remaining fuel chasing down Tempel 1, researchers said. The Stardust spacecraft was originally launched to visit the comet Wild 2 (pronounced Vilt 2), which it did in 2004. The spacecraft also collected samples of Wild 2 in a small container, which returned to Earth in 2006. After the Wild 2 comet encounter, NASA repurposed the Stardust probe to visit Tempel 1 and rechristened it Stardust-NExT (for "New Exploration of Tempel").